Sometimes I just don't have the time to set up a huge Heroscape war, defy the Great Old Ones in Arkham, or protect Fortress: America from the rest of the world. It's times like this that I look to Small Box Games for a quick card game that doesn't require hours to play or set up. 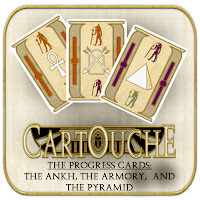 Today's entree into the world of fast card games is Cartouche, the latest Pure Card Line game from Small Box. 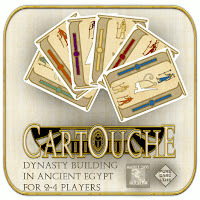 It's a deck building game where players vie for control of Egypt, attempting to create the greatest Dynasty in the known world. Now, I'm going to put out there that there are very few deck building games that I've ever really liked, including Dominion which I got rid of a month after buying, although Smallbox was the one that made me a believer in the genre when I played Bhazum, which I still play quite a bit. The concept of the game is that players call upon Egyptian deities in order to build their decks into more valuable cards and combinations of cards, and at the end of the game, when two of the Deity decks are out of cards, the players score their Dynasty deck based upon the types of cards they've won. In theory, it sounds to be simple, but Cartouche is not for the faint of heart; the rules, while diminutive, are very hard to understand until you've played a couple of times, and the iconography is such that the game takes you a good long while to actually figure out. This isn't to say that it's a bad game, it's more that it's got absolutely no text on any given card and so there's a lot of icon memorization. Think Race for the Galaxy, but harder. When you open the box, which is two standard size poker decks wide, you're met with the rulebook, which is larger than Small Box's usual size, and 144 half sized cards. Of those cards, there's only four cards that are not used for gameplay, and those are the reference cards. The art on the cards is pretty and definitely recreates the hieroglyphics that it is clearly trying to, although the folks I played with thought it to be bland. I was an Egyptian history enthusiast at one point of my life, and I went to school next to the San Jose Rosicrucian Egyptian Museum, which is the coolest museum in the area for all things Pharoah, so maybe I'm biased. Setup of Cartouche is pretty simple, but sorting the cards is a bit of a pain since they're so small and there's so many of them. Luckily, though, there's little color coded cartouches on the sidebars of the cards that allow for quick recognition and sorting. Anyhow, to set up the game, hand out the reference card to each player and then sort all the cards into six stacks based on the color of the deity cartouches. Once the stacks are made, hand one card from each stack to each player, so everyone starts with six cards. As per what Small Box Games has started to do to mitigate luck of late, there's then a draft round where each player, in turn, takes one card from their original hand, places it face down in front of them, and then passes their deck to the left until it's rolled around six times and everyone has six cards. Shuffle your 6 cards, place them face down into your Dynasty deck, and then draw the top 4, placing them in front of you as your Staging Ground. Once you're there, you're ready to build your Dynasty. I'd get into the nuts and bolts of how to play the game, but this game is very complex by my standards, so instead I'm going to simply give a short summary of what the basic premise is. Each round consists of four steps, starting with the Choice step, where you decide whether you want to play with what you have in your Staging Ground via a Standard turn, or you can alternatively choose a Shuffled turn, which allows you to take a card from the Exodus deck, which is non-existent at the beginning of the game, and discard it and then shuffle the Dynasty, Discard, and Staging Grounds together to create a new Staging Area, although you get to only play one card because you shuffled, and your Staging Area will only have three cards in it rather than the normal four. After you've chosen your type of turn, you move to the Blessing step, where you take cards from the appropriate Deity decks, based upon the icons at the bottom of cards in your Staging Ground. If you have pairs of matching deities on your staged cards, you can take the top card of that deity deck and place them on the bottom of your Dynasty Deck. This is a major way to get new cards into your Dynasty, although because you place them on the bottom of your deck, you may not see them for a while. Next is the Development step, where the meat of the game really happens. Depending on your choice during the Choice step, you can play either one or three cards from your Staging Ground. This consists of either discarding a card from your Staging Ground and taking two new cards from the Deity deck that matches the minor deity at the bottom of the played card, moving one of them to the Exodus deck and the other to your Dynasty deck. Now alternatively, you can play the card ability icon instead of using the deity icon, and this allows you to use the card's ability, which varies with the type of card ability icon. Card abilities can be used in conjunction with other cards you have in play to augment the cards, such as having an Armory card and a Soldier card in your Staging Area and playing the Soldier card to gain the War ability, thus stealing a card from an opponent. In short, the game is about creating combinations of card types to stomp the piss out of your opponents, forcing them to discard allowing you to gain cards either from the various decks or from the opponents themselves. Unlike Dominion, this is a very backstabbity game, and I think this is what really separates it from other deck building games of this type. The last step in a player's turn is the Replenish step, where you simply draw up cards into your Staging Area until you either have the maximum of four, or are out of Dynasty cards, in which case you'll probably want to play a Shuffled Turn next round to re-up. 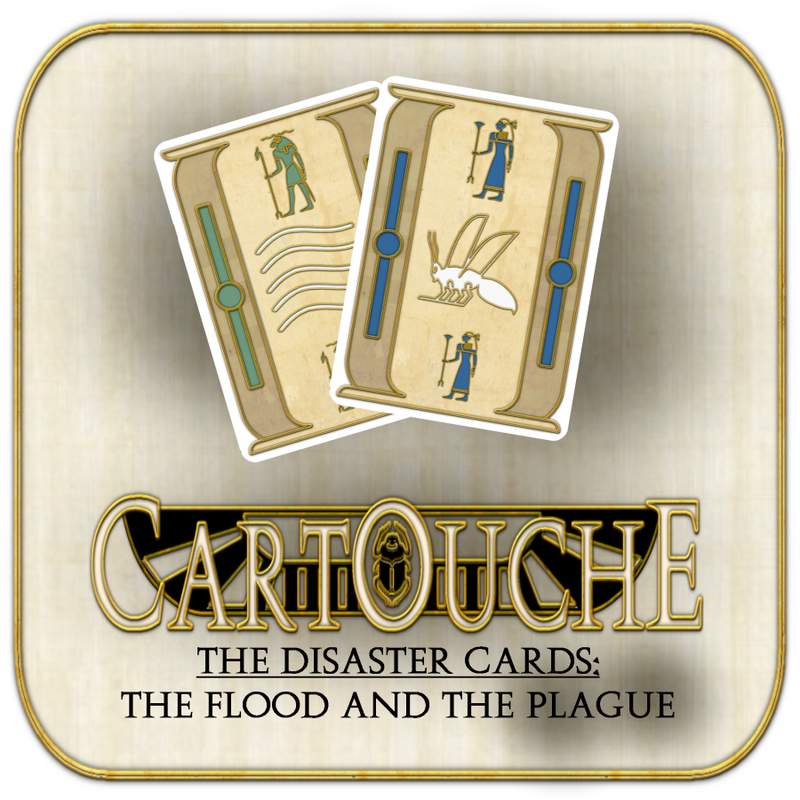 Cartouche, in a nutshell, is about getting your Dynasty deck trimmed to the best combinations of attack cards and points cards as possible, so that you don't get stuck with cards that are essentially useless or not good combinations in your Staging Area. It's not "mathy" or anything like that, and there's twelve different card ability types, so it's not like there's a huge amount of possibilities. The "mathy" part comes at the end of the game, when you do the scoring. The game ends when two Deity decks are gone, and it comes a lot sooner that you'd think, especially in three or four player games. Scoring was a little wonky for me every time I've played, but it gets more intuitive over time. Essentially, each Person card is worth one point, and for every three of a card type you have, if you have a matching Progress card type, you get to score that Progress Card too. The player with the highest score wins, goes onto become Pharaoh, and his distant heirs end up having their firstborn killed off by the Angel of Death! Some legacy, huh! 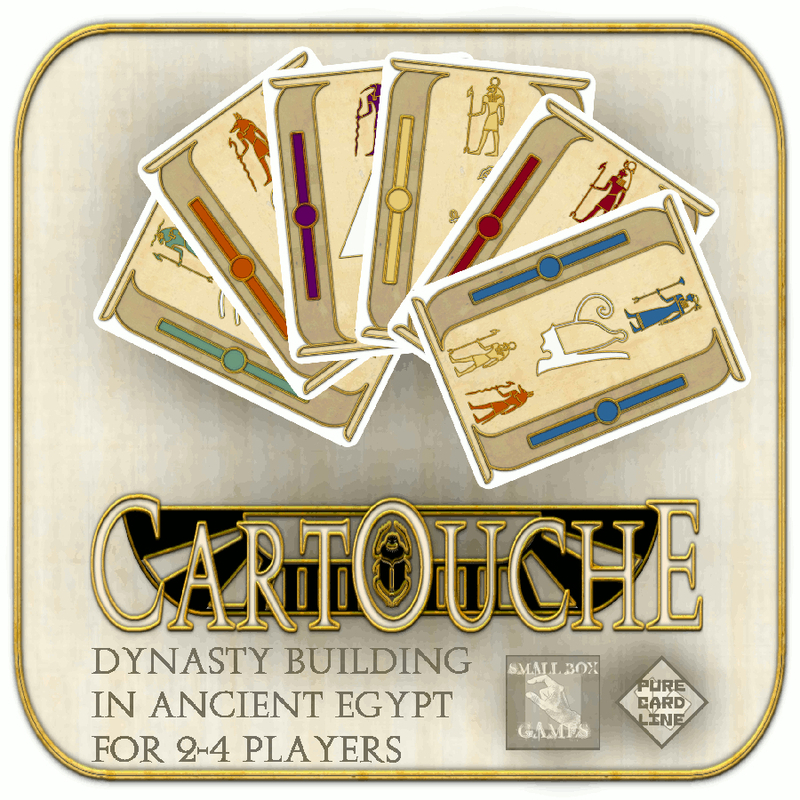 Cartouche is a pretty complex game with a ton of options and excels at player interaction and smart combination building, but the artwork is really only appreciated by those who like the sort of Egyptian artwork that is exhibited. Further hampering the game's appeal is the fact that the icons are plentiful and can be completely overwhelming, meaning you must refer constantly and copiously to the rulebook, which can slow gameplay down. Even after several plays, I still had to go back to the rulebook several times during my turn, and so did everyone else at the table, meaning that the rulebook essentially acted as a player turn marker. 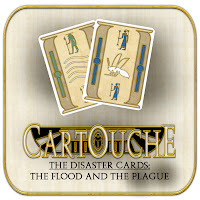 That being said, we enjoyed Cartouche fairly well, and the one guy in my group that digs Dominion said that although it was more complex, he really liked the idea and gameplay of the game. 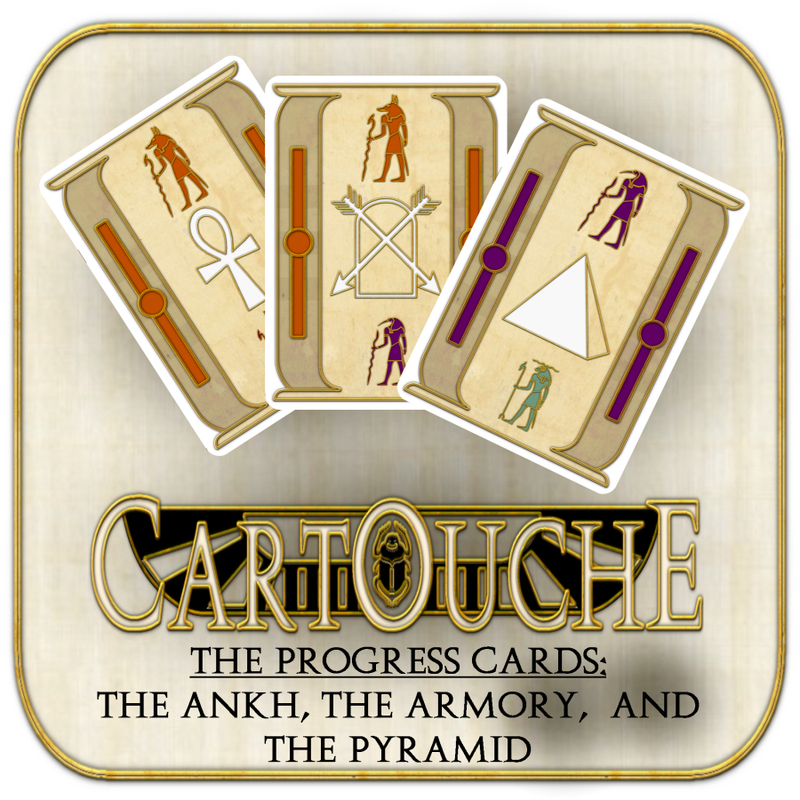 So, in short, if you like deck building games, you should certainly try Cartouche, especially if you think that these kinds of games should have more interaction and less multiplayer solitaire. 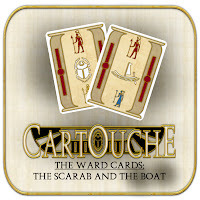 Cartouche is heavy on interaction and when you get past the intial information overload, it's a neat little game. Small Box combines shipping, so check out some of my other Small Box Games reviews, such as Bhazum, Irondale, and Politico: Fall of Caesar and see if you want to get a couple at the same time. Note: The Superfly Circus has officially received Porkinz' Stamp of 4pproval. If you weren't aware, it is a highly coveted prize, and I thank Porkins kindly for his acknowledgement of the skill and talent of the Superfly Circus Staff. w00t! !